Note: Fuel represents biofuels, motor gasoline, and diesel fuel. To increase the amount of biofuels in gasoline, the Renewable Fuel Standard (RFS) administered by the Environmental Protection Agency (EPA) was enacted through laws passed in 2005 and 2007. Today, about 10% of fuel sold as motor gasoline is corn-based ethanol. Renewable Identification Numbers (RIN) and Renewable Volume Obligations (RVO) are the mechanisms the EPA uses to implement the RFS program. RVOs are the targets for each refiner or importer of petroleum-based gasoline or diesel fuel, while RINs allow for flexibility in how each of them may choose to comply. The RFS, created in the Energy Policy Act of 2005 (EPAct) and revised in 2007, sets a target for the use of 36 billion gallons of renewable fuels by 2022. Each year, EPA issues RFS rulemakings calling for increasing volumes of renewable fuels. The proposed 2013 RFS target is 16.55 billion gallons of renewable fuels, including specified targets of cellulosic biofuels, biodiesel, advanced biofuels, as well an as overall target. The RVOs are applied to each obligated party's actual supply of gasoline and diesel fuel to determine its specific renewable fuel obligation for that calendar year. Obligated parties must cover their RVOs by surrendering RINs within 60 days after the end of each calendar year. 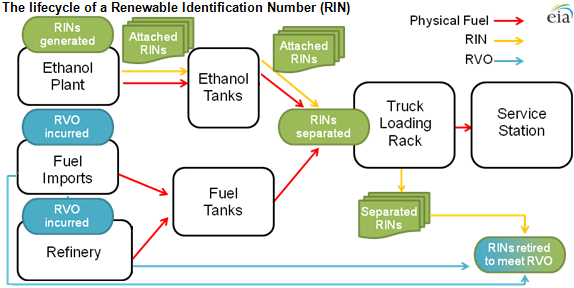 RINs are used for both recordkeeping and flexibility in meeting the separate RFS targets. Each RIN is a 38-character alphanumeric code assigned to each gallon of renewable fuel that is produced in or imported into the United States. RINs are valid for the year in which they are generated. However, up to 20% of a year's mandate can be met with RINs generated in the previous year. When renewable fuels are blended into gasoline and diesel fuel or sold to consumers in neat form (typically 100% biofuel), the RIN representing the renewable attribute of the fuel becomes separated from the physical biofuel and can be used for either compliance purposes or traded. Separated RINs have a market value attached to them and provide flexibility for obligated parties in meeting their RVOs. Obligated parties have the option to either acquire RINs by purchasing and blending physical quantities of biofuels, or by purchasing already separated RINs and submitting them to the EPA for compliance. In addition to being used for recording RFS compliance, RINs are part of the value of each gallon of biofuel to which they are attached. The value of RINs, which derives from the RFS program, provides an economic incentive to use renewable fuels. If RIN prices increase, blenders are encouraged to blend greater volumes of biofuels, based on their abilities to sell both the blended fuel and the separated RIN. If a biofuel is already economical to blend up to or above the level required by the RFS program, such as ethanol was from 2006 through much of 2012, one would expect the RIN price to be close to zero. When the biofuel is more costly than nonrenewable fuels but is needed to meet RFS standards or must be blended in greater volumes to be economic, the RIN value should increase to a point at which firms will increase biofuel blending. This Today in Energy article is the first in an occasional series looking at issues related to RINs.